The South Rage Carp is the most dominant species of fish in the Rage Lake and is popular among fishermen for the challenge they put up when caught on a hook. The largest South Rage Carp ever netted was a 36 inch master angler; caught by a Submin fisherman in 2005. 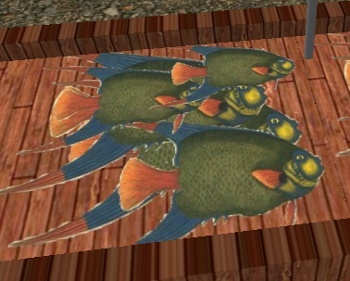 These fish have a very rotten smell to the Human population, but to Submins, it is considered a delicacy. The color of the fish varies from family to family but for the most part, the fish have a greenish body and bluish fins. You can usually tell a South Rage Carp apart from other fish from it's long, bright orange and blue tailfin. These fish are named South Rage Carp because they mainly reside in the southern half of Rage Lake and Niagara River. The freshwater that drains into the lake (which is approximately 60% saltwater) from the Niagara River is the optimal home for these carp to spawn and lay their eggs. Infant carp can only survive in a high concentration of fresh water and as a result, most South Rage Carp travel upstream to spawn instead of doing so directly in Rage Lake. Larger South Rage Carp, upwards of 28 to 30 inches, have been known to been fished out of the northern parts of Rage Lake which is about 80 - 90% saltwater. It is a proven fact that larger and older South Rage Carp have the ability to adapt to larger concentrations of saltwater. Some fisherman claim that they have caught a South Rage Carp in the northern Irenic Ocean and in the Rage River?, both of which hover in the 97 - 100% saltwater range. These claims have been stamped as myths by the scientific community. Marine biologists fear that if the freshwater concentration level goes down in the Rage Lake, the South Rage Carp could be killed off and driven to near extinction. As a precautionary measure, live Carp and eggs have been taken out and placed into a nursery at the Mango Land Zoo. Freshwater concentration and the volume of water coming from the Niagara Falls are constantly being monitored.